Pakistan Hands Over Captured Indian Pilot At Tense Border Checkpoint The pilot was captured this week after his MiG-21 fighter jet was shot down over the Pakistani-administered part of disputed Kashmir. A convoy carrying captured Indian pilot Wing Commander Abhinandan Varthaman arrives at the border post of Wagah in Pakistan on Friday ahead of his release. 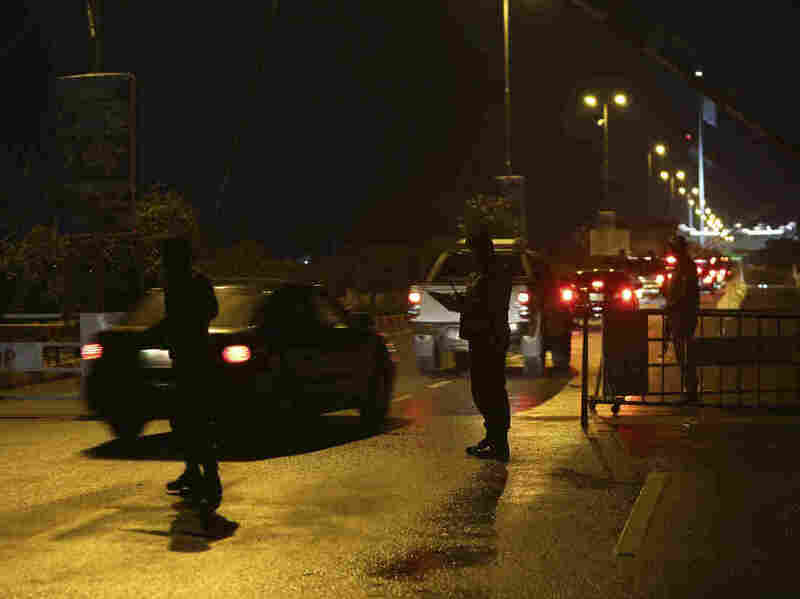 Pakistani TV showed Wing Commander Abhinandan Varthaman dressed in civilian clothes – a navy blazer and khaki pants – walking across the Wagah border crossing into India after dark on Friday. He was accompanied by an Indian diplomat and a Red Cross representative. After an exchange of documents, a large metal gate was opened, Varthaman strode through and soldiers on the Indian side put their arms around the pilot to welcome him home. The transfer was expected much earlier Friday, and Indian media reported a delay over documents. Ahead of the pilot's release, several dozen people waving Indian flags had gathered on the Indian side of the border. But most had dispersed by the time Varthaman finally crossed. Authorities canceled a daily sunset marching drill that involves elaborately strutting border guards from both sides and that often attracts tourists. Pakistani Prime Minister Imran Khan said the pilot was released as a "peace gesture." His fighter jet was shot down over Pakistani-administered Kashmir on Wednesday, when both countries accused the other of entering rival airspace. Following his release, Varthaman was taken for a medical exam, Air Vice Marshal R.G.K. Kapoor told reporters. Next he is expected to be flown to the Indian capital, New Delhi, where his parents are waiting. They received a standing ovation from fellow passengers on a flight to the capital early Friday. Despite hopes on both sides that the pilot's release might prompt a de-escalation, shelling continues along the Line of Control, the de facto border between the Indian- and Pakistani-controlled parts of Kashmir, a Muslim-majority Himalayan region that the two countries have fought three wars over. Two Indian troops and two rebels were reportedly killed in a gun battle Friday on the Indian side. The latest tensions began Feb. 14, when a suicide car bombing killed 40 Indian troops on the outskirts of Srinagar, the main city in Indian-administered Kashmir. A Pakistani-based militant group, Jaish-e-Mohammed, claimed responsibility even though the bomber himself was a local man. In retaliation, India claimed to have conducted airstrikes Tuesday on an alleged Jaish-e-Mohammed training camp inside Pakistani-controlled territory, killing "a very large number of terrorists." But Pakistan denied any damage or casualties, and some international observers have cast doubt on India's claims. Amid tensions between the nuclear-armed neighbors, India has arrested at least 400 separatists and members of a political and religious group that lobbies for an independent Kashmir. Late Thursday, India announced a five-year ban on that group, Jamaat-e-Islami, accusing it of links to militants. The group, created in 1942, runs schools, charities and libraries across Kashmir, and it has been banned in India twice before. 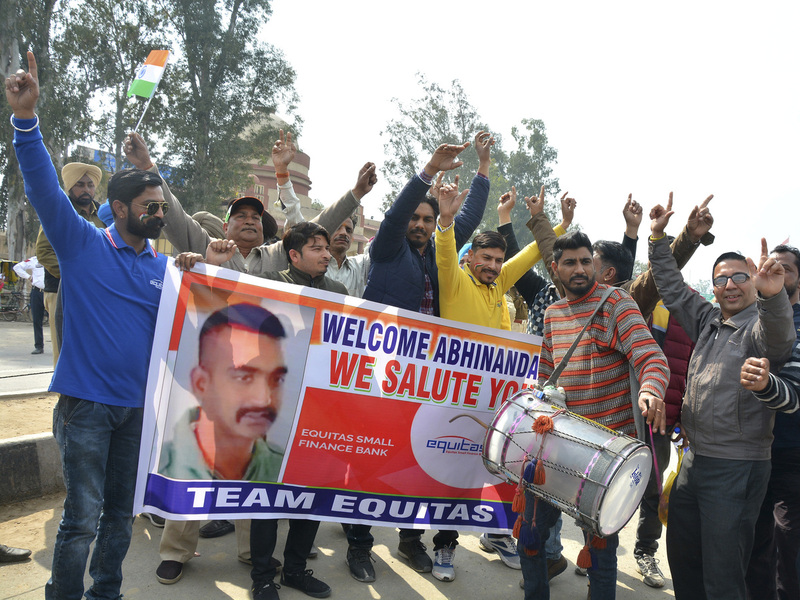 Indians dance as they wait to welcome Indian fighter pilot Abhinandan Varthaman at the Wagah border post with Pakistan, 17.5 miles from Amritsar, India. On Friday, Indian police laid razor wire and erected iron barricades in downtown Srinagar, prohibiting weekly Friday prayers at the city's main mosque. Unlike Pakistan's Khan, who addressed the nation and a joint session of Parliament in recent days, Indian Prime Minister Narendra Modi kept to his regular schedule of travel and rallies. He is running for a second term in elections expected this spring. At an event Friday in Tamil Nadu, the pilot's home state, Modi accused opposition political parties of "helping Pakistan and harming India." "This is a new India! This is an India that will return the damage done by terrorists with interest," Modi told the crowd. Also Friday, India's minister of external affairs, Sushma Swaraj, was the guest of honor at a meeting of the Organization of Islamic Cooperation in Abu Dhabi, United Arab Emirates. It was the first time India was invited to the gathering of 57 Muslim-majority states. "If we want to save humanity, then we must tell the states who provide shelter and funding to terrorists to dismantle the infrastructure of terrorist camps," Swaraj told the OIC. "This menace cannot be fought only through military, intelligence or diplomatic means. It is also a battle that must be won through the strengths of our values and the real message of religions." The foreign minister of Pakistan, an OIC member, skipped the meeting in protest at Swaraj being invited.